Don’t call them heroes. But these six Californian teens have powers that set them apart. Take Ethan, a.k.a. Scam. He’s got a voice inside him that’ll say whatever you want to hear, whether it’s true or not. Which is handy, except when it isn’t—like when the voice starts gabbing in the middle of a bank robbery. The only people who can help are the other Zeroes, who aren’t exactly best friends these days. Personally, I originally thought the US edition was excellent and they didn’t need to make any other versions — there isn’t anything in particular that is hyper-United-States-esque in the cover. But, now that I see the two other covers, *thumbs up! * It looks as if the UK and Australia editions are fan-remixed versions, but in the best way. The US edition is inspired by a three-part-wall-crack photograph that Westerfeldt took himself. This is exceptional considering that most authors do not have much say in cover design, which Westerfeldt mentions in his cover coverage. It’s good to be Scott Westerfeldt. My designer, the lovely Regina Flath, had sent us all an early version of the spray paint design. It was definitely moving in the right direction, but we wanted it to have a little bit more texture. It’s soooo like an author to tease out to a key plot point so casually in a cover announcement. I like that they carried the tagline over and didn’t revise it for each edition. The “o” in the UK edition — magnificent! Click here to see it a little closer. And the line down the center clevery cuts the “o” in POWER also. As far as appealing to adults, the UK edition wins — with Australian and then US editions a good distance behind. 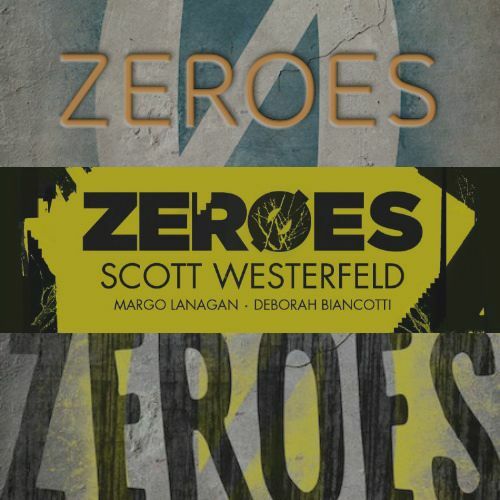 Which edition of ZEROES by Scott Westerfeldt do you prefer?